Besides washing and dewatering, one of the three main functions of a Fine Material Washer is classification. Classification is accomplished by adjusting the height of the three overflow weirs to control the amount of fine material that exits with the water. Keeping the weirs level allows less product-size material to leave the machine, and excess fines can be removed by lowering the back weir and raising the side weirs. One of the ways to control the amount of fines that overflow the weirs is to manage the overflow depth of the weirs. Increasing or decreasing the water gallonage can help you achieve your desired hydraulic mesh split. Eagle Iron Works provides a handy slide chart to help you determine the water gallonage needed for optimum classification. The slide chart is a numerical table inserted in a sleeve that features strategically placed cut-out windows. The windows show the numbers on the table that correspond with Eagle Iron Works’ various Fine Material Washer sizes to determine the recommended water gallonage per minute and screw speed for that machine. Measure the depth of the weir overflow using the ruler on the slide chart. Consult the chart on the right side of the slide rule (also seen below) to determine the approximate hydraulic mesh split. Eagle Iron Works recommends you use the 150 mesh split point for asphalt, concrete, mason and golf sand products. Use this chart located on the right-hand side of the slide rule to determine the hydraulic mesh split. Please note that the washer overflow gallonage is based on the three overflow weirs set level. Eagle Iron Works recommends a minimum of 50 gallons per minute of fresh water per ton per hour of minus 200 mesh material contained in the washer feed for proper washer operation. The rotational speed of the screw shaft plays a large role in the classification of fine material. With slower screw speeds, the finer material is allowed to settle out in the tub and sold as a saleable product. 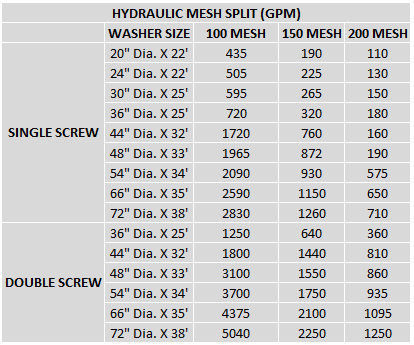 The reverse side of Eagle Iron Works’ slide chart can help you determine the recommended screw speed based on the percent passing the 50% mesh sieve. If you operate your Fine Material Washer at speeds that are faster than the slide chart recommendations, excessive turbulence will be created and will result in a possible loss of product-size material overflowing the weirs with the wastewater. Using the slide chart can help you determine the proper screw speed for your Fine Material Washer, which will allow for optimum product retention and washer operation. Determine the percent passing the 50 mesh sieve for the fine material product from the Fine Material Washer. Read the recommended revolutions per minute and maximum capacity for your Fine Material Washer at the specified screw speed reduction. Using a 24” single screw Fine Material Washer with our 15 to 20 percent example from above, the recommended revolutions per minute is 24 and the recommended tons per hour is 38. If you have a new application, Eagle Iron Works can assist you in calculating theoretical product gradations where product gradations don’t yet exist. for more information. If you have an Eagle Iron Works’ slide chart for Fine Material Washers, the instructions for determining the weir overflow gallonage and recommended screw speed are printed on the sleeve. The weir overflow gallonage side of the slide chart also includes a ruler with inch markings on the top and bottom of the ruler. You can use this ruler to measure your weir overflow depth. On the recommended screw speed side of the slide chart, the numbers in the top window represent the percent passing the 50 mesh sieve. The numbers in the bottom window represent rpm and capacity measured in tons per hour, respectively. To further aid the Fine Material Washer with washing, Fine Material Washers are equipped with Rising Current Classifiers to help to separate the deleterious material from the fine material. However, if you are losing product-size fines with the overflow, you can turn off the Rising Current Classifier or reduce the amount of water that enters the pool area.